Home > The Cook County Land Bank Authority: What Is It? The Cook County Land Bank Authority is a relatively recent development in the history of Chicago real estate. Founded only five years ago in 2013, the Land Bank was created as a county-level authority designed to address the sudden spike in vacant residential, industrial, and commercial real estate stock in Cook County after the bursting of the housing bubble and following financial crisis. Now approaching 20 million in resources on hand, the Land Bank derives the majority of its funding from grants, contributions, and revenues from its transactions. These sources of funding are notable because it is nearly self-sustaining, and as such, relatively insulated from political pressures of elected officials who would attempt to influence it to buy properties in one part of the county or another. While most land bank authorities are based on municipality, there are over 135 municipalities within Cook County, which would have made it essentially needlessly complex to create many authorities that all operate under Cook County law, and because of this, the county-wide land bank was born. As for its regular operations, the Land Bank engages in what it calls ‘washing’ land in order to prime it for redevelopment efforts and ease friction of transactions both for the seller and developer. To this end, the Land Bank takes care of a property’s upkeep while attempting to match it to a buyer – cutting the grass, maintaining its structural integrity, and undertaking a wide variety of other property management services. After undergoing this process, the Land Bank will put forth an offer price and, as opposed to the normal market, will not accept higher bids. Instead, the Land Bank will evaluate all offers at its initial asking price and attempting to make the best ‘match’ possible for those who they believe will best fit into the existing community. In this way, one can view the Land Bank as an intervening force that steps in to correct market failures. As the Land Bank’s mission statement reads, they strive “to promote redevelopment and reuse of vacant, abandoned, foreclosed or tax-delinquent properties; support targeted efforts to stabilize neighborhoods; stimulate residential, commercial and industrial development.” In order to achieve this goal, they not only conduct transactions and engage in property management, but also often serve as development/land use consultants, community leaders, pre-development specialists, and others to reflect this ambitious mission. With such broad goals across as diverse a space as Cook County, the Land Bank has had to formulate a targeted strategy in order to best use their $20 million resources to enact the largest impact possible. As such, they have created a strategy of pinpointing neighborhoods in transition – focusing their resources in areas that are neither wealthy enough where they do not need assistance, nor where there would not be a robust enough market for purchasing property. By targeting these neighborhoods, the Land Bank hopes to help generate enough economic growth that some neighborhoods become so self-sufficient so that they do not need their help, and they can move on to target new areas. 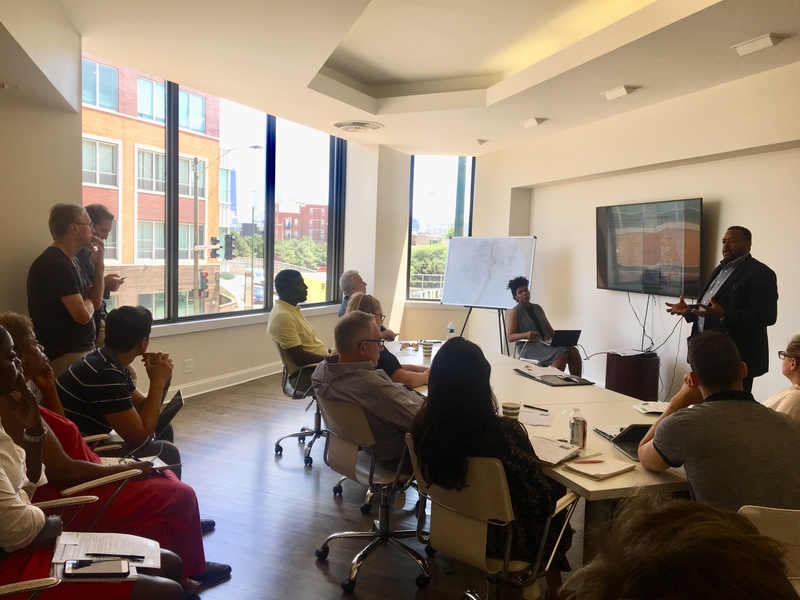 Thank you Rob Rose and Catherine Okoroh for taking the time to teach our agents about the Land Bank, the inventory, and how to make an offer! We can’t wait to use the Land Bank as a resource.